Welcome to the website of The Shadow of Nemesis, A Novel of the Spanish-American War of 1898. These pages serve as a brief introduction to the work; even more so, they specify what belongs to the realm of historical reality and to that of the author'simagination. Facts in "The Shadow of Nemesis"
The Shadow of Nemesis is a novel, not an historical work, however, in order to reconstitute as precisely as possible the context of the era, it relies heavily on the work of historians - American, Spanish, and Cuban - who have studied this period. Which part historical reality plays and which part imagination plays are addressed at the page Fact or Fiction. 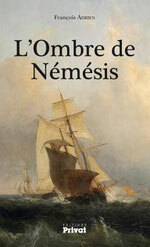 The Shadow of Nemesis is published by Editions Privat. You may purchase the novel (in French) by clicking on this link: Order L'Ombre de Némésis.